Reputation Management is the buzz word around at the moment. People are trying to put things right after there is a bad review or bad press around. Reputation Management is reactive marketing. You wait for the event to happen, then you do things to try and fix it or make it better. Now with the advent of the internet, twitter, facebook, directory sites and review sites, this information can get around quick and it can be damaging. Trying to police this is a bit of a nightmare. Google bought a company called Zagat about September last year for a lot of money (125 million). They have now implemented this system into it's Google Local Plus System to give business's ratings on customer reviews. People can now leave feedback inside Google from their Google Account. This can be very dangerous for anyone who has delivered a bad product or service, because now, these reviews are front and centre for the world to see. 80 Million business's on the planet are now naked and left to the will of the public and their ratings by the Google Giant. The thing is, only the reviewer can do anything about this, so going into damage control can be difficult. Reputation Management is a difficult process to employ if a bad review is left. 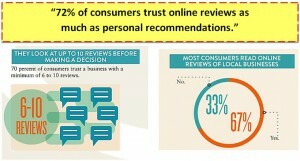 By people now based on previous reviews, testimonials or recommendations by online customers. The most powerful form of Business is Referral. Having a friend or colleague refer something is still one of the most power forms of getting business. However, now with the internet, people are now able to research business's and products and make a formed decision on a multitude of factors. The second highest form of business are reviews, ratings and testimonials. 1. You a recommended a business after asking a friend. You either go and do business, or you do some research. 2. You search online for the business, typing the business name into Google. Up comes their Google Places account front and centre. If there are reviews, a lot of people will generally go and read them to see what others have been writing about them. How recent they are also matters as well. 3. If you have good reviews, people might be happy with that and call you or buy from you. 4. If you you don't have so good reviews, or have none, they still might find another business to compare. 5. If they find another business with lots of good reviews, there is a fair chance they might change their mind and go with your competitor. So as a business owner, you need to influence potential customers to use your service or buy your product. How? The stats don't lie, get past reviews and testimonials where they can see them. 4. In your social media accounts, like facebook, twitter and google plus. [pullquote style=”left” quote=”dark”]Video Testimonials Have a 158% Better Conversion Rate Than Written Testimonials. [/pullquote] Most business's don't have a plan or strategy on how to do this. They haphazardly put up a testimonials page that is hidden in the bowels of a website or that doesn't stand out. They don't use video either. Video testimonials are one of the most powerful tools a business can use. 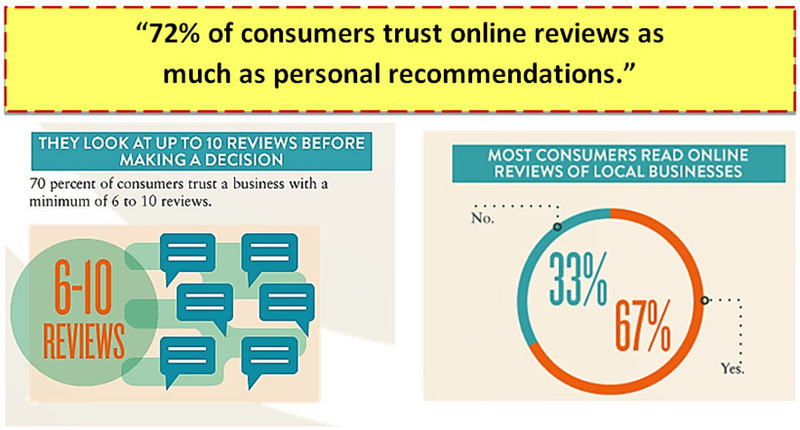 It is essential you track the reviews and respond to them to show potential customers you care. More importantly, if there is a bad or negative one, go into damage control to rectify the problem with the disgruntled customer. Again, this shows you care about your business and you care about your reputation. Not only that, the person who put in the review has the power to change or even withdraw the negative review. This is a fantastic proactive approach to reputation management. As a business owner, if you instill the importance of your employees treat customers, the level of service they provide, you will be able to foster an amazing reputation. 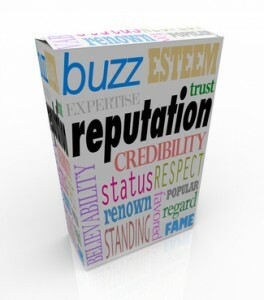 Your word of mouth reputation will spread, the ability to actively promote written and video testimonials will increase and more importantly, the likelihood of negative feedback will be massively diminished. Often, business focus on spending their money on getting their presence out there. Whether it is tv advertising, newspaper, online, radio. But a lot of that effort and money can be very well wasted if you haven't worked on your “Influence” to persuade potential customers to do business with you. Get your reputation solid, and the business will come. Reputation Marketing as you can see is different from Reputation Management. Marketing is proactive and Management is reactive. Look, I'm not saying at any time will you need management, but if you focus on Reputation Marketing, the management side of things, or the putting out of the fires, will eventually be none existent. My company and I have at our disposal a state of the art Reputation Management System that covers all bases. Great post, thanks for sharing Glen. You’re correct in that reputation management is more than just dealing with negative reviews! Keep up the great work.